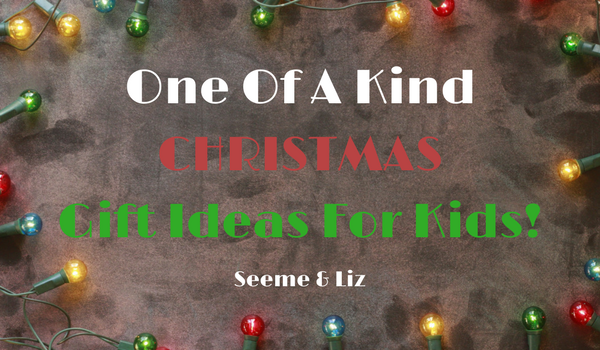 Seeme & Liz > Christmas Gifts > Christmas Gift Ideas For Kids – These 10 Are One Of A Kind! Coming up with Christmas gift ideas for kids can be tedious as nowadays kids have so much and the vast amount of toys out there is staggering. And so many toys come packed with claims of how great they are for your child’s development. Unfortunately a lot of these companies use great marketing techniques to lead you to believe what they want you to. In addition, I know some of you really try to support small businesses, many run by parents like you and I. So that is why I have decided to dedicate an entire article to high quality toys that are handmade. You can feel good when purchasing one of them. These toys can all be found on Etsy which is a great marketplace for small business owners trying to get their products into the hands of the public! 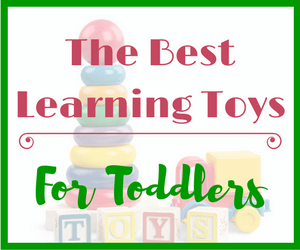 And as always, I will let you know how the toys that made this list can help with your child’s overall development and language skills. 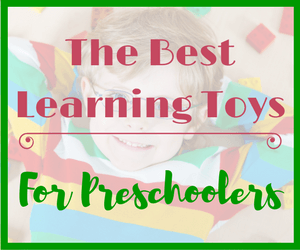 This list includes toys for babies, toddlers and preschoolers. Babies love to chew on just about anything. Putting objects into their mouths is one way that they develop their senses and explore the world around them. So why not give your baby a safe toy to chew on. Little ones also love their parents phones. But chewing on (and then usually dropping or throwing) mom or dad’s phone isn’t ideal. And, letting a baby play with a phone isn’t a great way to focus on your baby’s development (despite what the marketers of these apps would want you to believe). According to the American Association of Pediatrics screen time should be closely monitored and limited, especially for children under the age of 5. But this phone is great for both chewing and developing new skills. In a baby’s world a phone is for talking. So watch as your baby grows and develops and starts holding the phone to his ear. Soon you may even hear what sounds like a conversation. Take a look at all the ways a toy phone can be used to facilitate language development and learning. This set comes with a stacking toy, teething set and rattle. The simplicity of this set is what makes it perfect for a baby. It doesn’t have bright colors or flashing lights. Therefore, it should not overstimulate your little one. Rather, it will help with the development of important skills such as cause and effect (shake the rattle and hear it make a noise), fine motor control (pick up the “egg” and release it into the cup, grasp a wooden ring and release it on to the stand), size concepts (small, medium, large), etc. The materials used to make this set are wood, organic olive oil and organic beeswax. So you know that your baby will be safe with this gift set! This delightful set of vegetable rattles includes a carrot, tomato, radish, corn and beet. Inside each rattle is a small bell. These rattles are handmade using 100% cotton yarn so they are safe for your baby to explore with her hands and mouth. Skills such as grasping – releasing and cause – effect will be strengthened by your baby while playing with these rattles. As he gets older talk about the names of the vegetables. You can also point out the colors of each one. As an added bonus once your child is older they can be used as props in a kids play kitchen, or grocery store or market pretend play scenario. I love this Busy Board for toddlers. There are bigger versions available via Etsy but they also come with a bigger price tag (many I looked at were $100+). This one is great for small hands and perfect for car and plane travel. In fact, you could bring it along on grocery trips to keep your little one occupied in the grocery cart! 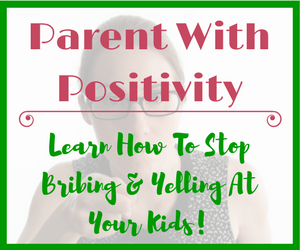 No need to bribe with snacks and cell phones! I would love to see toddlers (and even older babies) being handed one of these boards when they are fussy as opposed to mom or dad’s smartphone. 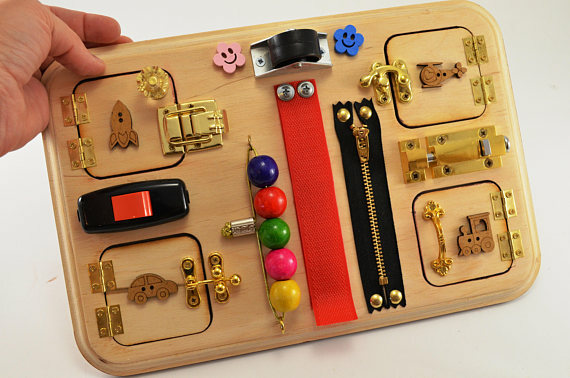 A busy board such as this one by Fox Family Boutique will allow your toddler to develop his fine motor and problem solving skills in a hands on way. This is much better than being handed a smartphone with a so called “educational app”. Your child can even learn new vocabulary words with this toy. For example: open, close, latch, lock, key, slide, turn, pinch, zip, etc. This board doesn’t make sounds so you don’t have to worry about it annoying others if your little one is using it in public. Most of the busy boards found on Etsy can be customized by sending a message to creator. Or if you are handy and into DIY projects, why not try making one yourself? 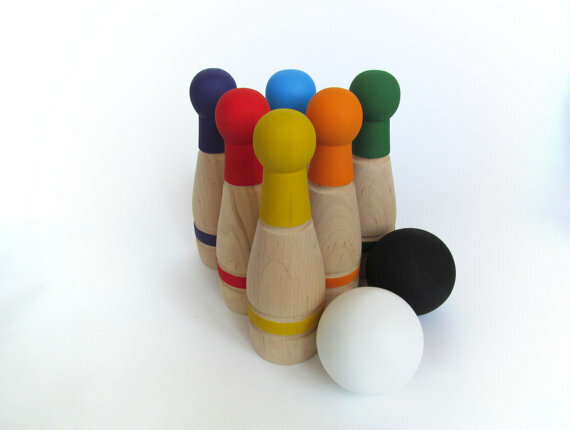 A bowling set will be a hit with toddlers (and even preschoolers). It’s such a simple game but can provide hours of fun while learning important skills. Did you know that learning to roll a ball and aim works on strengthening hand eye coordination and fine/gross motor skills? Since there are 5 pins you can also practice counting in a fun was as your child knocks down pins. Practice labeling each color that is knocked down! Was it knocked down by the white ball or the black one? My children had a bowling set when they were younger and I often used it in my speech therapy sessions. It had so many uses – from turn taking to learning new vocabulary words and sentence building! For example, if a child was working on saying 3 -4 word sentences or including pronouns I would print out simple pictures and place one under each pin. Each time the child knocked a pin over he would say “I found a ____”. Keep in mind that an activity such as the one mentioned above was done in a structured setting with very specific goals in mind. And I used this technique with children who were 3 years or older. This is such a simple concept which you could easily make yourself. But it would be time consuming. Don’t worry, the Etsy shop “Curious Minds Busy Bags” has you covered. 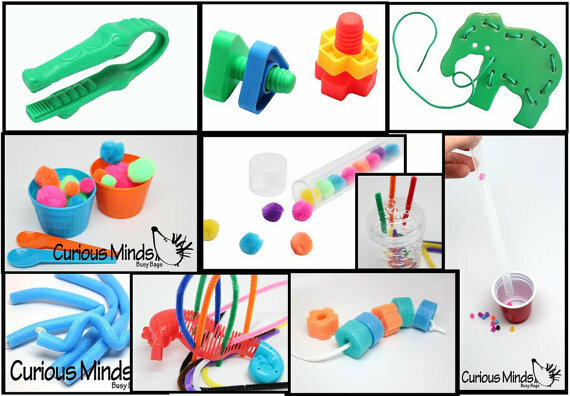 They have taken the time to pre-assemble 10 simple activities that will not only keep your toddler occupied but also help with her learning and development. You can see what is included in the picture below. A full description of each activity on the seller’s Etsy page. The seller has also taken the time to list the learning objectives of each activity. These are great to have in your purse or diaper bag and can be pulled out and played with pretty much anywhere! But remember, it is important to let your child explore on their own too. You shouldn’t always try to fight boredom for them. There is nothing wrong with being bored. In fact, some of the greatest ideas come from being bored. Unfortunately this is a skill that kids nowadays are not developing because so much of their lives are structured for them. 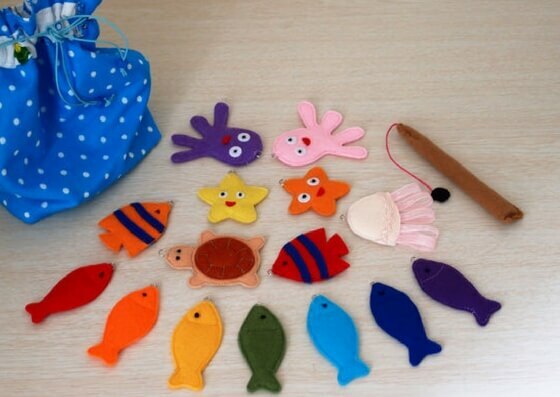 This charming felt fishing set will be a hit with your toddler! It is nice and soft so nobody will get injured by being hit across the head with a wooden fishing pole. It is also very compact and fits nicely into the small bag that comes with the set. Practice skills such as turn taking, labeling and recognizing colors, labeling and recognizing sea animals (fish, octopus, turtle, starfish, jellyfish), fine motor skills (getting the magnet in the pole to stick to the little metal ring on each fish). Additional skills which this simple toy targets include concentration, hand eye coordination and pretend play. Because of all the skills that can be strengthened with this game, it is also appropriate for preschoolers. My grandparents had the most amazing teepee for the grandkids many years ago. I still remember how much fun we had in there having tea parties, pretending to be camping and we also decided that it was an igloo for a while! You have probably seen many kids tents, they are everywhere. And I am a big fan of those as well. Since a teepee is just like a tent, click here for the language and learning benefits that can be explored with a tent! This teepee is completely customizable. You can order it with poles or without and you can choose the number of poles (3-5) as well as if you want windows or not. 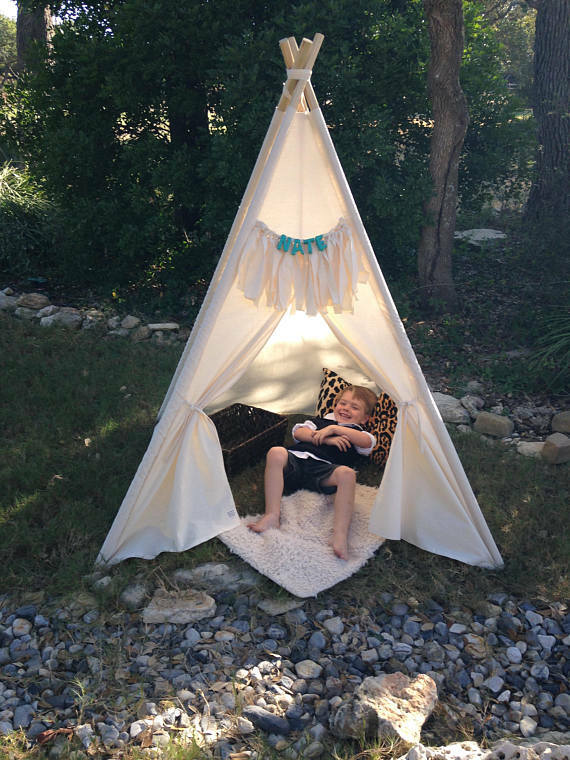 You can also choose to purchase accessories from this seller including an adorable cloth campfire or have your child’s name made out of wood to be hung on the front of the teepee. What a great idea! I love how low tech this toy is. I know there are many kids cameras around, but sometimes it is nice to get back to the basics. Childhood is short, children do not need every tech gadget out there for fear that they might fall behind with technology. As we know technological advances are occurring rapidly, and this means that what was current last week might be old news next week. 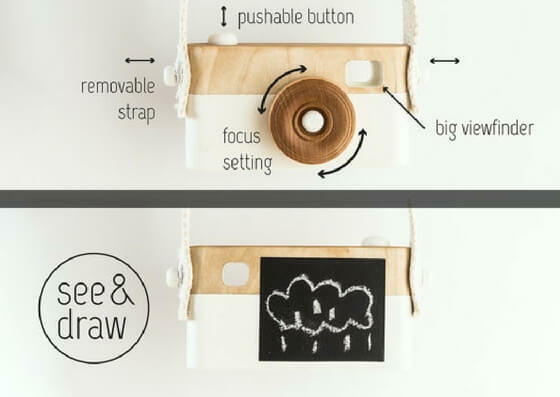 This camera has functioning buttons, a lens that turns and the best part is the little chalk board on the back. Your child can use his imagination and take a picture of a rocket flying into space if he wants! This camera would also be appropriate for a toddler! 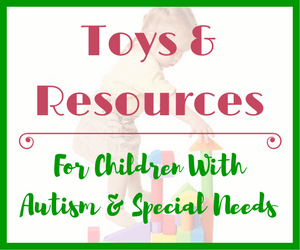 Every child needs to have a toy farm set! There are so many opportunities for language skill building. This charming farmhouse set comes with 13 painted figures and accessories including animals (cow, pig, sheep, duck, horse), 2 trees, carrots in a garden, 2 fences and the farmer and his wife! This would make a very special gift as it can also be personalized with the child’s name on the top of the barn! All of the pieces can be stored in the farmhouse which makes it easy to take along on outings. 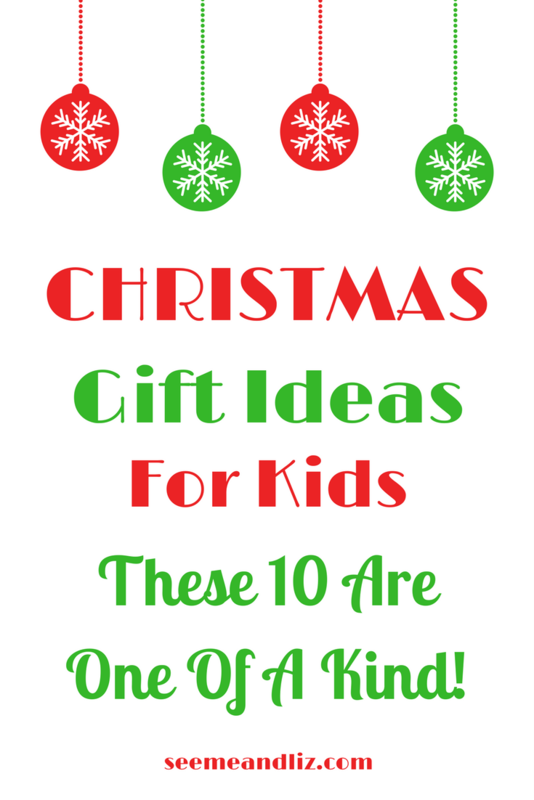 Which Will Make The Perfect Christmas Gift For Your Child? 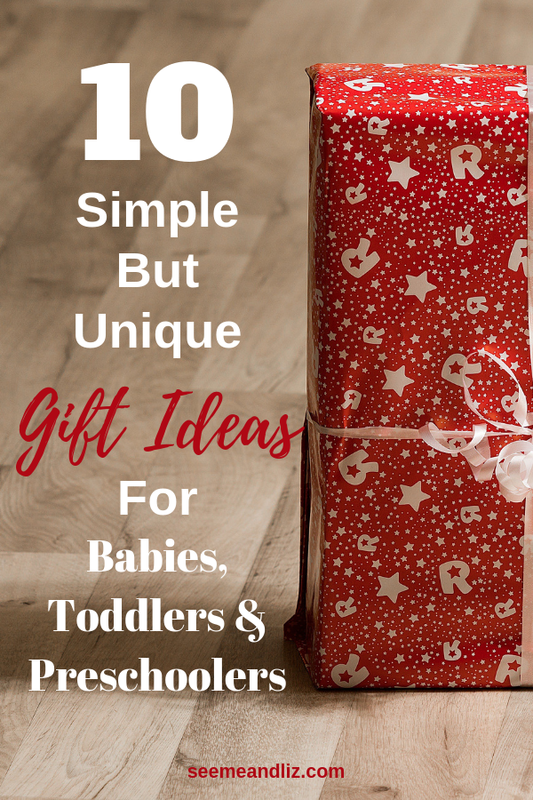 I hope that these Christmas gift ideas for kids have given you something to think about! These are more than just toys. They are made by small business owners trying to support their families. A lot of thought and hard work has gone into the making of these toys. And they are all wonderful from a language development and learning standpoint! The toddler busy boards are becoming very popular. And with good reason! Toddlers absolutely love playing with these, perhaps as much as playing with a mobile phone/tablet. However, they are actually learning new skills playing with something as simple as a busy board. 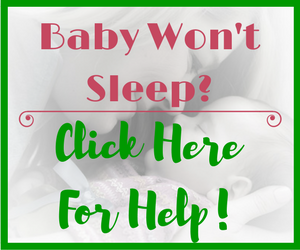 The baby toys I have listed in this article are safe for babies. If you have any specific questions about the types of wood/paint used, it is best to contact the Etsy seller directly. 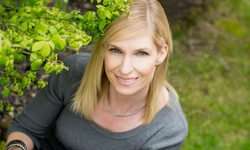 Thanks for your unique list of christmas gift for kids Tanja. It’s literally a lifesaver! And I’ll be bookmarking it for kids birthday presents too. You are too right when you say these days kids have a mountain of toys and its so hard to buy something that they don’t already have. I loved the toddler busy board! That is something I’ve been meaning to make myself and I know many friends want but don’t have time to make. That might be my first purchase from the list! I’m glad I was able to help you out! We had a toddler busy board for our kids when they were young. These boards really are fascinating for little minds! Our was given to us as a gift, but they don’t look all that difficult to make. But you do need a few tools and all of the items you want to attache to the board. So I can also see why for some it might just be easier to purchase a premade one! I am always looking for unique gifts for my three grandchildren ranging from ages 9 months to 8 yrs. Your site has wonderful ideas. I am buying the bowling set for my 3 yr old grand daughter. She will love it and I am looking forward to playing with her. Thanks, and have a wonderful day. I’m sure your grand daughter would love the bowling set! Bowling toys are so much fun for children! I’m glad you were able to find something on this list for at least one of your grandchildren! 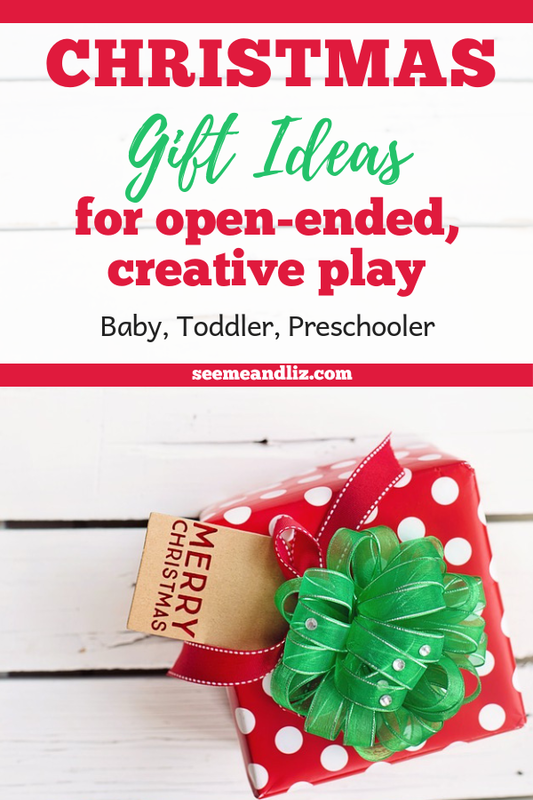 These are very cute ideas for young kids! My toddler would love those crochet rattles and my older boys wouldn’t be able to get enough of the bowling pin set. I was a little concerned about the wooden teething phone though. Is that something that could hurt your baby? Is it safe for a baby to be chewing on anything made of wood? Thanks for your comment. 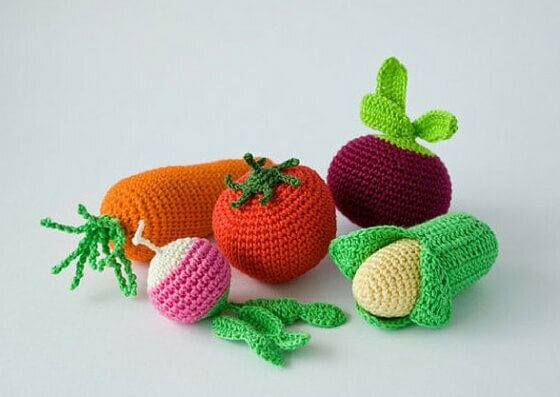 I love the veggie crochet rattles because older children can use these as well as part of their pretend play games. The wood used for the teething phone is non-toxic. 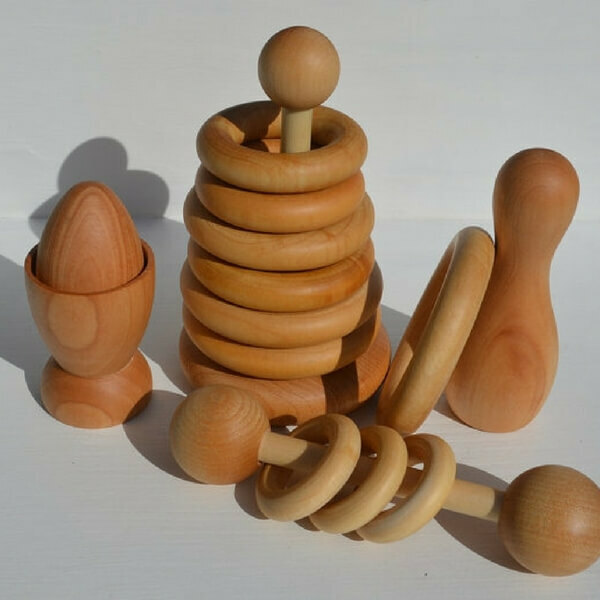 There are many wooden teethers out there so they are very safe. I would be more comfortable with those than the plastic versions! But it is up to you. You may have noticed that the corners are rounded so there are no sharp edges that could lead to cut gums or lips. I love these ideas! I am a huge fan of wooden toys and I especially love the busy boards…I have been wanting to make or buy a large one or several smaller ones for my home daycare. It’s great that these purchases support small businesses and that the materials are non-toxic. Any ideas for older kids?